I’ve never really been able to figure out what Square Enix’s deal is with the App Store. They go from releasing full iOS-exclusive titles like Chaos Rings ($6.99) to flat-out weird “games" like Voice Fantasy ($2.99) (among other zany titles). The just-released 774 Deaths ($0.99) seems to come from the same “why does this exist" department as Sliding Heroes ($0.99). Billed as a “murderously difficult action platformer" 774 Deaths, according to Squeenix, is “certain to chew up and spit out even the world’s best gamers." The format of the game goes a little something like this- You play a pixelated little dude going through rooms filled with locked doors. To progress through the doors, you need to complete the mini-games that each room has to offer you. So far, I’ve been given the choice of four games, each with the same basic principle of navigating your guy to the end of the level while avoiding what appear to be blood covered blades. Each “game" has a different control method. There’s an auto-runner style game where you tap the screen to jump, a platformer style game with virtual controls, a vertical falling game controlled via tilting, and a similar tilt controlled top-down maze-style game. None are particularly interesting, and I really can’t quite decide if the game itself is difficult, or if the controls are just terrible. Either way, you beat two of the games inside the room you’re currently in, the next room unlocks, and you repeat the process. Admittedly, I’m stuck on the third room right now, but there hasn’t been much variation to speak of yet. Per the iTunes description, there are 9 rooms in all. 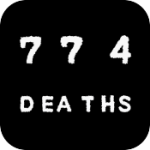 For what it’s worth, people in our forums seem to be enjoying 774 Deaths. So, if you’re a glutton for punishment, give it a shot…?